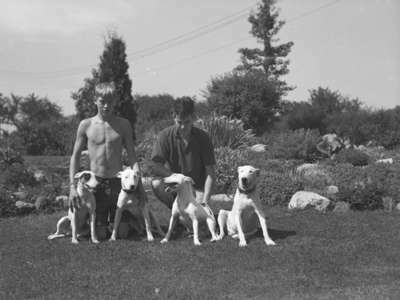 A black and white photograph of two unidentified persons and 4 dogs in front of the garden at Inverlynn house. Inverlynn house is a house which is currently located at 1300 Gifford Street in Whitby, Ontario. Back in 1946 the address was known as 816 Gifford street. It was the residence at the time of this photo of Catherine McGillivray Schell (née IRWIN) (1917-2005) and Herbert Robson Schell. the Schell family had four children: Katherine "Katie" of Whitby, Peter of Kingston, Andrew of Whitby, and Malcolm of Pickering. These items were collected and assembled by Garry Barrett then sold to Gerry Hicks. The Whitby Archives (Whitby Public Library) purchased this material from Gerry Hicks in 2004. Inverlynn - Whitby, 1946, Marjorie Ruddy. Whitby Archives A2013_040_1249.